Taipei has a huge number of restaurants. Noodle places can cost from as little as 40NT/$1.30 and up, and with a side dish of vegetables for 20NT+ $0.75, it easily becomes a full meal. The best area in central Taipei in terms of affordability, quality and variety is between the main train station and the 2/28 Peace Park(二二八和平公園) eat like a king for under $5 dollars! 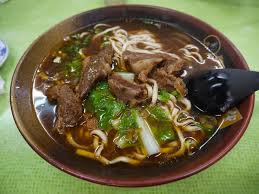 Restaurant food has all the variety of night market food, and of course Beef noodle soup(牛肉麵) is the Taiwanese classic. With tender cubes of beef in a hearty soup, you can't go wrong with this. In fact the huge selection of different noodles makes every noodle dish a rarity. My absolute favourite are the big noodles chopped off a massive block of dough. Often you will see the chef preparing these at the front of the restaurant. 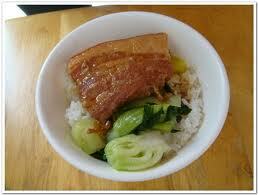 I personally love Pork Braised in Soy Sauce(爌肉飯). This often includes rice and a side dish of vegetables too. Finally the thick soups like Dumplings in sour and spicy soup(酸辣湯) are so warming and hearty that you almost get that Christmas feeling from them. These were my favourites but Taipei has so much more to offer, its worth making the most of your time there, eating as much as you can!